How to choose them, How to keep them. Publisher: A & C Black Ltd. The Illustrated Guide To Chickens is a beautifully presented book that covers 100 of the most familiar breeds of chickens found across Europe and North America. 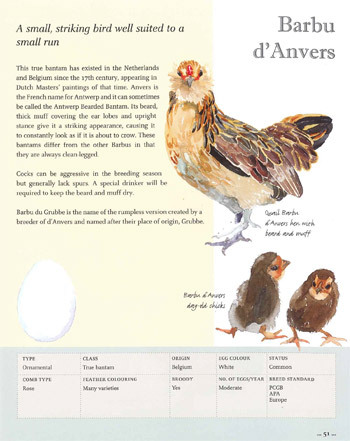 Every breed has been painted by the author and artist Celia Lewis (who has co-written two other books on hen care) and accompanies a comprehensive breed profile, covering the breed history, pertinent breed characteristics and some tips about special breed requirements. As well as the information about each of the individual breeds, there is a good introductory section that covers some basic information on feather types, plumage and markings and the descriptions of feather patterns. The descriptions we use to describe plumage patterns such as Millefleur, Wheaten and Chamois, (always difficult to remember) are defined. A handy reference that I shall be referring to again I’m sure. There is some good basic advice on feeding, housing, hygiene, breed classes and acquiring or breeding your own stock and I really liked the quick reference guide found towards the end of the book which has a handy table listing the breeds with their type (e.g. layer or ornamental), class (bantam or game), egg colour and whether they are likely to go broody or not. If you are trying to decide which breed to keep, or you would like a reference covering the most popular breeds available, this book should be on your short list. Beautifully presented, a book worthy of a prime spot on my shelf.